bReconstructed slice thickness; original slice thickness is twice as high with 50% overlap. °Minimum calculated acquisition time without considering duration of individual respiratory compensation. Abbreviations', a, flip angle; FOV, field of view; GRE, gradient-echo; MR, magnetic resonance; NSA, number of signals averaged; RFOV, rectangular field of view; SENSE, sensitivity encoding; TE, echo time; TR, repetition time. Abbreviations: GRE, gradient-echo; HASTE, half-Fourier acquisition single-shot turbo spin-echo; MR, magnetic resonance; TSE, turbo spin-echo. survey MR urograms are acquired with a 256-matrix size and a large field of view (FOV) that display the entire urinary tract with moderate spatial resolution (Fig. 4A-C). On the other hand, a small FOV is used to obtain detail MR urograms with increased spatial resolution (Fig. 4D). The reduced FOV of a detail MR uro-gram may include either the kidneys and proximal ureters or the vesicoureteral junction and the distal ureters. Using a 512-matrix size is also feasible in MR urogra-phy to further improve spatial resolution, which, however, is obtained at the expense of SNR and scan time. In critically ill patients or adolescents unable to suspend breathing during the acquisition of a 3-D GRE sequence, the navigator echo technique can be employed for avoiding respiratory motion artifacts. The resulting total sequence duration, however, is increased to several minutes. In babies and infants, breath-hold imaging is impossible, but sufficient compensation of motion artifacts may be achieved with conventional respiratory gating (4,23). Data acquisition without any motion artifact suppression may also be tried in small children but often results in inadequate urographic image quality. Figure 4 (Figure on facing page) Normal gadolinium-enhanced excretory MR urogram. (A-C) Survey MR urography obtained using a 3-D GRE sequence with an FOV of 360 mm. MIPs display the urinary tract in different planes. (A) Coronal MIP. (B,C) Oblique MIP images visualize the vesicoureteral junction on either side separated from the bladder. (D) Detail MR urography of the pelvicalices obtained with an FOV of 300 mm permit better spatial resolution and delineation of caliceal fornices. Abbreviations: FOV, field of view; GRE, gradient-echo; MIP, maximum intensity projection; MR, magnetic resonance. WHICH MR UROGRAPHY TECHNIQUE IN WHICH SITUATION? Situation 1. Sonographically, no hydronephrosis and no atrophy of the renal parenchyma are seen; the serum creatinine level is normal or slightly increased (below 2 mg/dL). 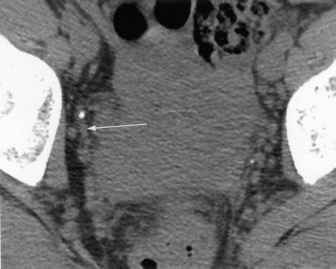 Patients often present with uncharacteristic flank pain and/or microscopic hematuria. In this situation, T1-weighted gadolinium excretory MR urography in combination with only 5 to 10 mg of furosemide has proved excellent for achieving a complete and detailed depiction of the nondilated urinary tract with good SNR. A compression device is unnecessary. Situation 2. Slight or moderate hydronephrosis (grade 1 and 2) is known; there is no or minimal parenchymal atrophy and serum creatinine level is normal or slightly increased. Both MR urography techniques are well suited in this situation. We may start with T2-weighted MR urography, which readily identifies the level and degree of obstruction. If we are satisfied with the morphologic information seen on T2-weighted images, MR urography may be terminated at that point. Otherwise, gadolinium-enhanced T1-weighted MR urograms can be added easily, which often permit the best assessment of the configuration and length of a ureteral stenosis and provide functional information on the impaired urine flow through the obstructed ureter. 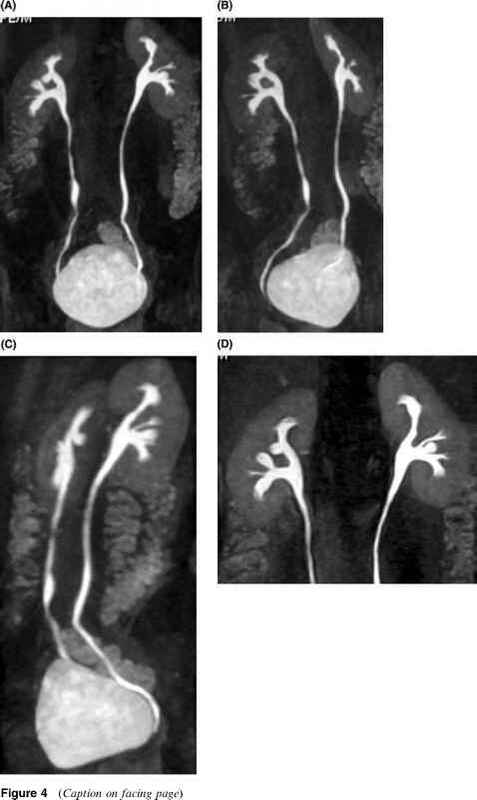 Late MR urograms, beyond an acquisition delay of 30 minutes after injection of contrast material, are usually not necessary because the renal excretion is not reduced too severely. Actually, this situation favors the combination of static-fluid and excretory MR urography in one session (Table 3). Situation 3. A high-grade, often chronic hydronephrosis (grade 3 and 4) is known and associated with parenchymal atrophy and severe excretory malfunction. Because there is a large amount of static fluid present in this situation, T2-weighted MR urography is the imaging technique of choice for demonstrating the degree of hydronephrosis and the level of obstruction even in nonexcreting kidneys. The only situation in which neither T2- nor T1-weighted MR urography really can help is in patients with shrunken kidneys and severely impaired excretory function not caused by obstruction. These patients often suffer from chronic renal insufficiency, for example caused by diabetes mellitus, glomerulonephritis, and analgetic nephropathy. Another exception to these three clinical categories is that of pregnant women, in whom solely T2-weighted static-fluid imaging is a useful MR urographic technique if ultrasonography is unconclusive. There are a wide range of anatomic variants that can be imaged accurately with MR urography. The absence of ionizing radiation makes MR urography the method of choice for the detection of congenital anomalies in children. T2-weighted MR urography has proved excellent for imaging anomalies associated with an increased amount of fluid and/or kidney malfunction, such as ureteropelvic junction stenosis (Fig. 5), megaureter, and cystic kidney disease (4,23,39-42). Tl-weighted excretory MR urography is preferred for the demonstration of anatomic variations in the nondilated collecting system, including malrotation of the collecting system (Fig. 6), caliceal diverticula, small ureteroceles, unobstructed bifid systems (Fig. 7), fusion anomalies, and medullary sponge kidneys (3,4). The diverse MR urographic techniques may even be applied for visualizing ectopic ureters (Fig. 8) (23). Furthermore, in children with urinary tract anomalies, it appears to be very promising to combine MR urography with MR nephrography for obtaining morphologic information plus quantitative functional data, including split renal function similar to scintigraphy (31,40-43).